Location: Centro Catequístico of El Viejo, Nicaragua. Theme: the issue of children left behind after parents migrate away from the area. Keywords: migration; violence; gangs; sexual abuse. Notes: The interview was held in Spanish, but MM translated for DP, AHJ and RH at times. The original Spanish is left here in the file. 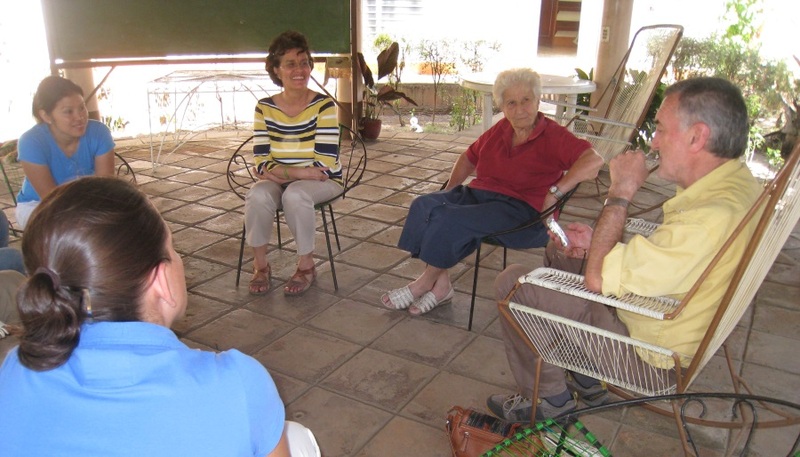 Sister Abdontxu (SA): Sister Ana Lourdes is busy organising the El Viejo Youth Centre. Come along [to Ana Lourdes], because they want to talk a bit about the issue of migration. Martin Mowforth (MM): Ana Lourdes, I was explaining to Abdontxu that one thing I should like to do is to conduct an interview about the problem of migration – specifically the problem that Sister Abdontxu has told me about before: that is, the problem of children left behind here without father, without mother, perhaps even without the grandma. So perhaps you can give us an explanation of this phenomenon, especially relating it to this area of El Viejo and the Cosigüina Peninsula? David Pickles (DP): So just to clarify, the problem is emigration of parents leaving the country. MM: That’s right, exactly. I thought when they first mentioned it to me about two years ago it was a real problem with immigration, actually it’s the other way, it’s emigration, and children left parentless. SA: I was telling Lourdes this that I’ve already been chatting with you about earlier, right? The issue of migration in Nicaragua is very acute. The data we have is that for every ten families, seven of them have a family member out of the country. Yes, and in particular, quite recently, it’s the emigration of women that has been the problem. And very many women migrate especially to Spain, where they find work more easily, work which is appropriate for women than in other countries. In many cases you know the situation of families in Nicaragua is that the woman is actually the mother and the father, because many households are headed by women, a significantly high proportion. And the males basically disappear off the scene a lot of the time so the woman has to do all the work, as the breadwinner and looking after all the children. And so, with the women emigrating, the kids are left without either mother or father. And very often the role of the mother is taken over, assumed by the grandma instead. So the grandparents put in much effort and dedicate themselves to the children, but it’s not the same having the grandma looking after you as having the mother – not only on the level of the love they give, which perhaps they do, but for providing all the necessary follow-up. The role of the grandma is a lot more difficult than the role of the mother. And in the same way, they are left with an aunt because the grandma may die – the aunt also is not able to perform exactly the same role in terms of either love or understanding or closeness, as a mother can give. It’s the mother who best fulfils the role of the mother. It’s not quite the same. SA: At the same time as this, or perhaps as a consequence of it, what happens is the abandonment of the children. Every time where there’s no father, no mother, no grandma, it generates gangs of youths, the ‘pandillas’, here in the barrios. And that in turn gives rise to a greater aggression, greater violence, and greater threat on the streets. Another effect which arises, as a consequence of this, is the abandonment of the schools as well. That’s another very important factor. And also the pandilleros put their money into drugs …. [Inaudible – a lot of noise.] …. Also, another problem that arises is that the mother sends money back, the majority from Spain, to the aunt or grandma or whoever’s been placed in charge of them. But often the children will tell the mother that they’re not given any money and that they should send it direct to them. So the mothers fall into the trap and send the money direct to the kids. Again that causes more conflict – a major conflict. Do you know Neli? Neli worked with us in the field of health, in the pharmacy. Well she was left in charge of her nephews because her sister went to Spain. Well, what I was describing happened to her – the mother sent money to her. Now the boy is in jail – it’s already the third time that he’s been put away. MM: And how old is he? Sister Paulina (SP): He’s 16 or 17 years old. SA: There are lots of cases like these, but I’m telling you about this one because I thought you might know Neli. She’s been very close to us, carrying out work with us for over 20 years. Her sister went to Spain and left her children with her. MM: And the son of 16 years old, he’s …..? Sister Ana Lourdes (SAL): With the money that his mother sent him, he bought drugs, alcohol. SA: It’s a concrete case of what we were talking about. There are many like it. SAL: And another problem is abandonment, and not having anybody close to them to give some sort of follow-up, there’s a lot of sexual abuse. Teenagers getting pregnant really early – at 14 or 15 years old. SA: At the national level, many denunciations have been made about what we are talking about. In part it’s a consequence of the abandonment by the two parents. I can’t remember the data now, but it doesn’t come up much in the press, although it has increased – youths of 14 years old, young children pregnant. SAL: Family committees have been created …..
SAL: ……. so that when there was a family problem or a case of physical abuse, of the wife or within the family, they would go to the committees, so that they didn’t have to go to the courts, but instead to those committees. MM: In all the barrios? SAL: In the schools and in the communities. And then, instead of going to the family court, they go to these committees. And yesterday in the press it was reported that the committees should recommend to the mothers that when they go to place a complaint of sexual abuse of the daughter, they should make it with the abuser present. But the girls of 14 years who were abused by a man of 30 or more years, instead of making the complaint that would result in prosecution, the committees suggest that they should marry the abuser. Amy Haworth Johns (AHJ): Did they [the Sisters] set up the committees? MM: And were you responsible for the creation of these committees? MM: No, the government set these up. SAL: And there is a problem, and that is that some women’s movements are denouncing the committees. There is a law, Law 779, which protects women from abuse and from violence. But the problem is that instead of going through the courts and a judge, they take their cases to these committees. These are committees of the family, but the people on them are not trained. That’s a really big problem because at times they act as intermediaries advising them not to prosecute the cases – in other words, so that they don’t pursue the legal process of the denunciation. So the problem of migration is very complex. It involves unemployment, abandonment, abuse, violence, gangs. MM: So, a question please. You, the Sisters, run some programmes working with abandoned children, don’t you? Here in the Centre? SAL: It’s a Jesuit project. It’s called the Jesuit Refugee Service. MM: And it’s a programme designed by the Jesuits? Sister Ana Noemi (SAN): It’s a network. DP: What’s the main problem? The gangs or the problems of abuse within the family? SA: Some of them join the gangs, and it’s a major problem when they join. 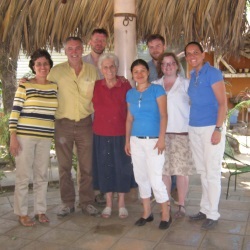 Sister Paulina (SP): Both the women and the men. SA: All of them suffer as a result of abandonment, and some as a consequence of joining the gangs. But not all of them join the gangs. SAL: In this area here, the problem of drugs is a relatively new problem. You know, 10 years ago this problem didn’t exist here. And it’s growing – a lot. SA: One thing we have observed is that internationally there are many media reports and many organisations defending migrants, but very little is spoken about the consequences which are left here. So, here, that’s what we’re dealing with now. And the Jesuits carried out a study on the level of migration from the country. MM: In this country, in Nicaragua? SAL: Yes, and the result was that Chinandega was the area that had most emigrants, after Managua. So here in Chinandega they opened an office, and we link with them to work as a network with them. It was a study which they did in El Salvador, at the University of UCA. A study of the children, sons and daughters of emigrants, who are not building a life project [identity / ethic]; but instead ……. They’re not building their identity for the future, for their own life project. For example, they don’t feel as if they have an identity, say as Salvadorans, or as Nicaraguans. Because their mind, their future, has been put into the United States or Costa Rica or Spain or wherever they migrate to. And they might spend 8, 9 or 10 years thinking like that. And the problem of the children of migrants and the adolescents is growing. So they go as well, and sometimes never come back. And their identity continues on standby, because they’re waiting for them to return or to return themselves. And so they’re in a stage where they aren’t a person, they have no identity, they don’t belong to anyone, nor to a family, because they’re waiting, maybe to get there themselves. And when they do get there they still can’t construct a life for themselves because they don’t belong to anything or anyone. AHJ: It’s a lost generation. SAL: Gangs, drugs – there is no sense of life. There’s a lot of suicide here. AHJ: Everybody looking to try and belong. MM: So, many thanks for your words. …… Many thanks indeed.